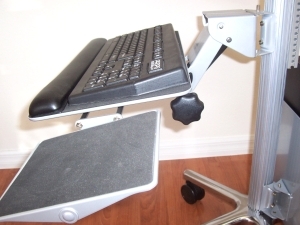 This is the ergonomic keyboard arm that comes included in the configuration of the VC01 Pole Computer Cart. It comes with all the hardware necessary to attach it to the slotted aluminum pole. By adding extra monitor mounts, keyboard trays and shelves, a VC01 Computer Cart can be simultaneously be used by more than one operator. 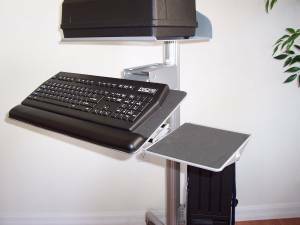 This ergonomic keyboard tray is totally adjustable: height, tilt and swivel. The shelf includes a gel wrist pad along the front edge. The mouse tray is also tiltable and has a rubberized pad. Tilt and height adjustments are secured via an oversized knob to lock into the desired position. 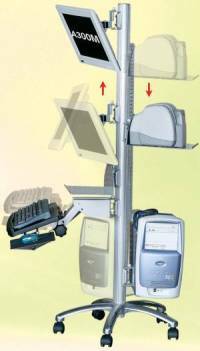 The keyboard tray's attachment to the pole is totally height adjustable along the pole and swivels, as well as all the other attachments to this PC pole cart.